Synesthesia from the Ancient Greek "syn", (together) and "aisthēsis" (sensation) — a neurologically based phenomenon in which stimulation of one sensory or cognitive pathway leads to automatic, involuntary experiences in a second sensory or cognitive pathway. For example, seeing colours whilst listening to music. People who report such experiences are known as synesthetes. One could think of it as the opposite to anesthesia ( anesthetic ) - ie the lack of senses. "Colour is the keyboard, the eyes are the harmonies, the soul is the piano with many strings. The artist is the hand that plays, touching one key or another, to cause vibrations in the soul." Wassily Kandinsky, artist, cellist and synesthete. I've always had music-colour synesthesia, although I never knew that it had a name until about 2007. Ever since I can remember, listening to music or playing the piano has always been associated with colours in my mind's eye. I never thought about it as being particularly unusual or different - in fact I never really thought about it at all. It's as normal and unremarkable as breathing. It doesn't affect my vision in any way but it does add a very beautiful dimension to my appreciation of music and I feel very lucky to experience it every day of my life. Music-colour synesthesia has been around a long time. The great Russian-born visual artist, Wassily Kandinsky, who was also a musician, used color in a highly theoretical way associating tone with timbre (the sound's character), hue with pitch, and saturation with the volume of sound, all ideas which make complete sense to me. Isaac Newton was intrigued by the concept that colour and musical frequencies could be correlated, however, I have read about and spoken to people with music-colour synesthesia who are adamant about their particular fusion of the senses and, for example, colours we see for the same tones are completely different. Generally I see higher pitched tones as lighter and brighter colours than lower ones which tend to be darker or more saturated - and when I hear several musical instruments together - forming a genre of music, there are many colours combined - exemplified by my pieces of artwork entitled Jazz and Jazz III (the piece entitled Jazz II is still evolving…). Cool lounge jazz has always been surrounded by dark-ish blue (twilight colour - Jazz), Dixie conjures up yellows and whites and Latin has lots of fiery reds and oranges associated with it (Jazz III). 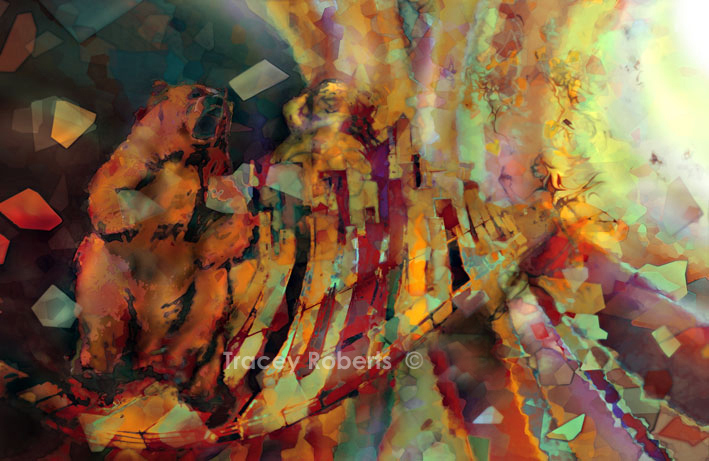 I suspect I have a quite a few more artistic works in the Jazz series to come! Hearing certain musical instruments in isolation creates very strongly coloured and even shaped or textured reactions: the sound of a cello is always a full, blood red, a flute sounds thin and silver blue, piano music is always black and white: Sometimes the images are very hard to describe or “grab on to”– an accordion always has a multiple set of colours - I see multiple streamers of festive colours in that case - other times the explanation seems straightforward as certain musical instruments will take on the colours of that instrument: saxes sound bulbous and bright gold, trumpets sound silver, the double bass is velvet brown. 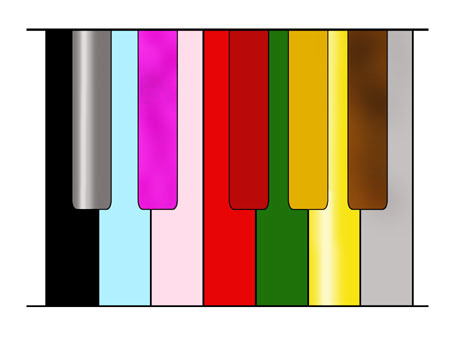 As a piano player, I have certain colours (and sometimes textures too) for certain tones - particularly in the middle octaves. As I go up the the keyboard everything turns whiter and down the lower end of the keys everything turns dark. It’s not a surprise to me that many people have never heard the term "synesthesia"
One theory is that because it is not considered an illness or life-threatening disease, it doesn’t attract much media attention. It is also invisible (although some of us express it through art!). People I know who have it don’t talk about it – not necessarily because they don’t want to but because, like me, they don’t consider it to be a big deal. I only stumbled upon the word by accident - I was at the Melbourne Museum a few years back, in the Mind and Body section, when I wandered into a "black screen phone box" and listened with joyful recognition to a young man talking about how he saw colours when he listened to music and that he "loved having synesthesia" - what an epiphany it was for me! I couldn't wait to get home and tell my family about this wonderful discovery. I was so thrilled that there was a word for this thing that I had grown up with, because it meant that I could start researching it and talking to people about it... and of course there's LOADS of information about it. I was also pleasantly surprised to find that some of my artist and musician friends have it too to varying degrees - some of whom I've known for years and we've never ever talked about it. Of course, much has been written and studied about synesthesia - there is a plethora of information available on the internet about it and its various forms. I was quite delighted to read all about it and to discover that some musicians I have always admired (Tori Amos and Billy Joel for example, and even Mozart - all pianists too, interestingly) also have this wonderful brain wiring! I'm also still discovering more of my musical colleagues who I've known for years have it too. It's hilarious! It’s a wonderfully intriguing phenomenon, even though I’ve been familiar with it all my life, and I enjoy immensely the fact that I can now translate my particular brand of music-colour synesthesia into my art and combine it with the performance elements of my work, creating and sharing a completely fascinating and inextricably connected visual and performing experience.